Whether you want to build a dance studio, update your existing dance studio, build a new sports gym, or open any other medical/sports facility, chances are your largest investment is going to be flooring. This ultimate guide to sprung dance floors will help you make the best decision for your facility. Historically, the choice of performance flooring surface for theatre & dance was between a wooden floor and linoleum. That’s right, people use to dance on linoleum. Numerous types of floor were also needed because of different forms of dancing: Ballroom Dancing, Ballet, theater performances, etc. Thus, hardwood floors were developed and installed many different ways. This type of sprung flooring was installed many different ways, was labor intensive, and very costly. Some of these types of sprung flooring proved to be far too “bouncy” for ballet, contemporary artistic dance, and other types of dance and performance. Not only were the floors to bouncy but they also had hard spots. A hard spot is essentially locations on floor where it was less “bouncy” than other spots. The hard spots occur where the wood planks under the flooring cross each other. Can you imagine jumping from a “bouncy” spot (flaw number 2 above) and landing on a hard spot. Although the early variations of sprung dance floors were flawed, they led to two positives. First, they were extremely popular. Thus, illustrating the need for innovation. Second, companies saw the demand for semi-sprung floors which led to companies continuing to invest and innovate. Over recent years, modern floor construction methods were developed. These modern construction methods removed the bouncy or trampoline effect of the early sprung flooring systems. The modern day well-designed sprung dance floor techniques better suite the performance needs of dancers, athletes, and theatre performance for today standards. Today, Sprung dance floors have a number of names: Floating Floors, Suspended Floors, Sprung Flooring, Resilience Floors, Free Floating Floors. There are two primary reasons to invest your time and money in buying the right sprung dance floor: Injury prevention and performance. Medical professionals, from MDs to Physical Therapist, that specialize in dance and athletic injuries have established a link between the quality of the flooring and injuries. A sports sprung floor for dancers and athletes, with a degree of resilience is strongly recommended. The design of the sprung floor is what reduces the impact on joints, muscles, overall stress on the body. One safety certification you should look for are DIN standards. DIN standards were developed in Germany and are recognized worldwide as one of the best methods for evaluating sprung floors. The standards were developed to test shock absorption, resilience, surface friction, impact, and surface stability. DIN standards are used by manufacturers to ensure the performance of the sprung floor has the greatest degree of safety. You can think of DIN standards as your cheat sheet to finding a sprung floor that measures up to your safety standards and needs. Performance is a key factor in sprung dance floors. It is directly related to the surface of the floor. Performance of a sprung dance floor has several key factors. One important factor is proper resilience or progressive shock absorbency. This helps to lessen the impact, by providing progressive shock absorbency, for the demands on the floor as well as other higher impact routines of the dance style or venues being performed. That is why Din Standards are provided by the manufactures to show this design feature. Another factor is the performance surface of the sprung dance floor. The floor should have a degree of traction, that allows the performer to fully and artistically express movements without the fear of slipping or falling. Proper foot stability is essential to reduce foot roll-over and other injuries. As previously mentioned, some performers will decide to roll out vinyl dance flooring over the hardwood surface. If you don’t, then the sprung wood dance floor should have some degree of traction provided in the finish. Most have a polyurethane finish or a sport lacquer finish. For example, Dance Equipment International Elite Springflex dance floor has a polyurethane finish. The Oak Flex and Maple Flex Sprung Dance Floors have a sport lacquer finish. The finish seals the hardwood for superior durability and helps provide a safe traction coating. These types of finish also make the maintenance and cleaning of the floor easier and more hygienic. In short, the type of finish is an important factor in the performance of your floor. Maintenance and cleaning sprung dance floors is fairly simple. However, it is a must if you want to protect your investment. Cleaning your floor will make sure it remains functional and beautiful throughout the floor’s lifetime. How often you clean the floor primarily depends on the amount of usage. Keeping the floor free of dirt, dust, oils and debris is most important. Doing so helps prevent injuries from falling, slipping, losing, traction, etc. Regular maintenance should include sweeping, using a dust mop, or using a vacuum cleaner. This should be done daily, 2-3 times a week, or once a week depending on traffic. This will keep the dust and dirt down to a minimal. Oils from bodies and sweat cannot always be seen on the wooden floor surfaces. However, they are present. Weekly cleaning recommended. To clean the floor Bona Kemi hardwood floor cleaner is Dance Equipment International’s recommendation. Lightly spray the dust mop head with the cleaner and wipe the entire floor surface. You may also spray a light mist directly on the floor. However, only use a light mist and dry it immediately with a dry mop. Never allow liquid to sit on the wood flooring. Water should never be used to clean a wood sprung dance floor. If a janitorial service is used, make sure they are aware of the correct way and product to use on the wood flooring. Liquid getting into a seam is not good on any wooden floors or the sub floor underneath. Try to dry it immediately. As previously mentioned, we have recommended Bona Kemi for years. If you choose a different cleaner, make sure it contains no wax or oil soap. These products will trap dirt and grime and eventually leave your hardwood floor dull in appearance, slippery, or sticky. Wax build up will also make the recoating of you floor more difficult. Again, never use wax or water in cleaning hardwood flooring. Flooring installers, flooring stores, architects, or people installing their own sprung dance floor need to know what the general use of the floor will consist of. It is important to determine every style of dance or activity that will be performed on sprung dance floor. Sometimes we are given the total square footage of the sprung floor location. That is OK if you are looking for a rough estimate of costs. However, the layout of the room is absent. Therefore, the way the floor will need to be laid may not be as accurate. The best way to get an accurate estimate is to provide the linear feet by width and length. That helps give us the proper measurements and an accurate cost estimate. Also, you should lay the planks of wood running the long length of the room. Approximate square footage does not provide this useful information. If the room is a perfect rectangle or square the length & width measurement in linear feet should be close to an accurate measurement. Some larger jobs, new construction, or remodels will provide architectural drawings that provide technical and specific measurements of the facilities. If architectural drawings are not available, you can simply make your own drawing. On a piece of paper make a simple drawing of the room with any measurement of obstacles or any cut-out in measurement of linear feet. Include the doorways and any openings to another room or hallway. Also include areas that will line-up against carpet. Any open edge of flooring or doorway may require a ramp or lip-over reducer (also called a transition edge). These measurements are needed to help provide your finished edges. Sprung dance floors can go over concrete. It is important the existing concrete slab is level. Most concrete does have a certain amount of moisture. Therefore, polyethylene goes down on the cement as a moisture barrier before the sprung dance floor is installed. Polyethylene is a plastic film. Generally you do not need to remove the existing floor. Sprung Dance Floors can go over vinyl flooring and some types of low pile carpets. When shopping for selection of products and cost estimates, we can help select the proper sprung dance floor, the material you will need, and the necessary tools. Online technical information and telephone support is available from the beginning to the completion of the sprung dance floor installation. This list is from Dance Equipment International. It includes questions that we are asked on a daily basis. These questions are from studio owners, home owners, designer architects, builders, flooring contractors, etc. They will help you and give you a place to start. What Location Will The Dance Floor Be Used In? You need to know the size of the area as this will help you get estimates in costs. More importantly, you need to know the type of location, i.e. is the building an industrial building, commercial building, or a residence. The type of location is important because you need to know various factors such as sub-flooring, moisture, and temperature. Answering this question will help with picking the right floor and the proper way to install the floor. This in the long run will save you money because the floor will last longer. What Are You Using The Floor For? Ballet, jazz, tap, modern, ballroom, irish, flamenco, clogging, aerobics, exercise, martial arts, multi-purpose, etc…. Different types of dance require different types of sprung floors. Some will want to dance directly on a finished floor. Others will want to dance on Marley flooring. Knowing this can save you a lot of money. For example, sprung floors provide the optimal flooring to lay Marley on top of. However, if you are using Marley flooring all the time, you can save money by getting an unfinished sprung sub floor instead of a finished floor. Want more information on Marley flooring. Click here for our Ultimate Guide to Marley Flooring (Coming Soon!!!). Who Is Using The Floor? Different teachers will have different needs and opinions. We definitely recommend consulting your instructors before buying your sprung floor. Do You Need Sprung Floors For General Stage Use? The primary reason is that damage often occurs to floors being used for general stage use. Solid wood sprung dance floors can be sanded, refinished, or rescreened time and time again. This helps preserve your investment and longevity of the floor. Is It New Construction Or Renovation? Some sprung floors in renovations need to be low profile (the thickness of the wood) depending on the existing building. What kind of floor is currently in the facilities and the condition of the existing floor helps determine what needs to happen before installing your sprung floor. For example, is the floor cement? If so, you should always have a moisture barrier before laying the floor. If the area is humid you may want to do a moisture test called a calcium chloride test. You’ll also want to determine if the existing floor is level, if there are holes in the existing floor, and if there is exposure to extreme heat. Are you instlling the sprung floor in a basement, first floor, second floor, etc…? This is extremely important because of moisture and humidity. In commercial properties for dance studios or sports usage, the landlord may be responsible for the cost of the flooring or in the sharing of costs. Also, shipping costs vary tremendously if going to a residence versus going to a commercial property. Do you own or rent the facility…or are you a school? Whether you own or rent is extremely important. For example, if you rent you may want a removable sprung floor. This also applies to schools. If you decide to change spaces (classrooms or multi-use rooms) or build a new building you may want to move the floor with it. Having the actual linear foot measurement, such as 20’ x 30’), helps ensure the sprung floor will fit the space in the best way possible. In most installations, the sprung floor should run parallel with the longest wall. Providing square footage instead of 20’ x 30 is OK as long as the square footage is extremely accurate. Whether you are a dance studio, school facilities, athletic facility, etc. your main investment will be your sprung dance floor. You want to make sure your investment will last, has been tested, approved, and meets or exceed the industry standards. The most important thing you will want to know is that your sprung floor provides resilience and the proper friction for the dance style or venue being performed. Dance can be extremely taxing on the bodies tendons, joints, bones and muscles. Sprung dance floors are designed to help lessen impact. 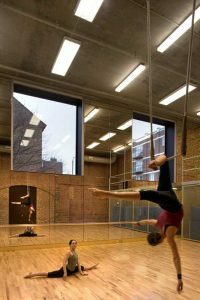 It is necessary to provide a safe environment for your dancers, teachers and studio owners. Dance Equipment International has provided service and support to Dance Studios, Schools and Universities, Parks and Recreation, Community Centers. Churches, Theatre and Auditorium Stages, Fitness Clubs and Gyms, Private Residence, Hospitals and Physical Therapy services, Architects and Flooring Contractors. We want our experience and years of being in business to help answer your questions. Our company wants to have an understanding of your needs and priorities to help you select the best flooring system for you and safety in your work environment.